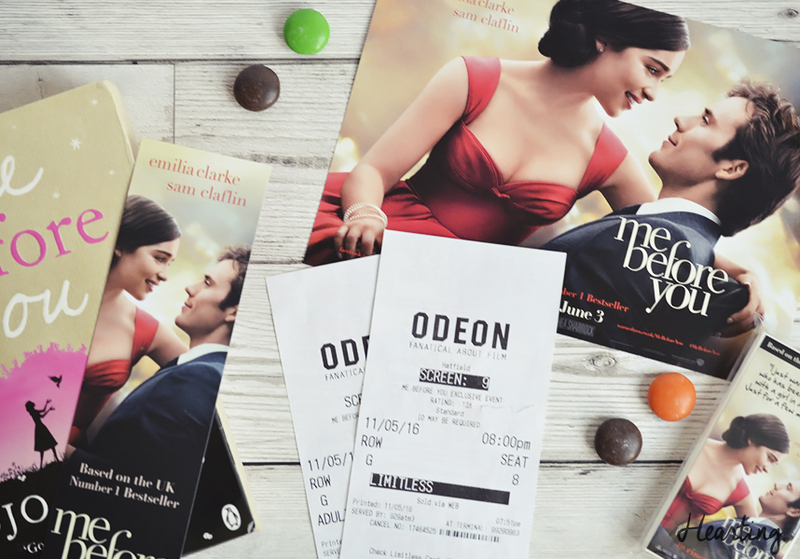 It was by complete chance that I spotted that my local Odeon was running an exclusive preview of the film adaptation of Me Before You by Jojo Moyes. I’d been eagerly awaiting for the film to come out in June, but getting to watch it a month before the official release? It just seemed too good to be true, so I quickly purchased 2 tickets for my Mum and I.
I read Me Before You by Jojo Moyes around this time last year, although I can’t remember every single detail this book has stayed with me and I regularly think of it. When I heard that a film was going to be made I was so excited as I love a good film adaptation. When I first watched the trailer for Me Before You, I wasn’t sure whether Emilia Clarke and Sam Claflin would be suitable for their parts as Lou and Will and whether they would have the right chemistry. In hindsight, I didn’t need to worry as they were both perfect for their roles. Me Before You is the heartbreaking story of Will Traynor the quadriplegic that has lost the will to live after a motorcycle accide, and Lou Clark who loses her job and becomes Will’s carer. I don’t want to give too much away because both the book and the film are really worth experiencing for yourself. In my opinion the film is spot on, I don’t think they could have done a better job with this adaptation. I absolutely loved it. Like the book it made me feel all of the emotions, I cried a lot, I laughed a lot, and then I cried some more. Like any film adaptation they can’t include everything but they did manage to include all of the important bits to really recreate the entire story on screen. I can’t wait until the official release on the 3rd of June as I just have to go and watch it again. Like the book, I know that the film will be a favourite of mine for years to come! Are you looking forward to the release of the film adaptation, Me Before You?